I fell in love with smoothies last Christmas, when our old blender bit the dust. The combination of wanting to eat healthy after the holidays and an itch to use that beautiful black Breville led to a lot of experimenting and weeks of drinking breakfast through a straw. Refreshing, healthy and portable… a great start to the day! One day I saw the brilliant idea of putting your smoothie ingredients in a large mason jar instead of your blender pitcher. Screw the blades and ring to the top of the jar, set it on the blender base and voilà! You can blend and drink your smoothie right from the same jar you started with. When you pop the blades into the jar, make sure they don't touch the sides, and only try blending this way if your jar threads fit the blender ring perfectly. Standard jars and standard blenders make this look easy, but not all jars/blenders are standard. If you haven't tried this, you should! Who loves washing their blender pitcher by hand daily? My smoothies usually involve more than a few ingredients per jar and I soon realized that as much as I love them, with taking things out, measuring ingredients, cleaning spoons from yogurt to honey to peanut butter or flax oil, handling frozen berries, and putting everything away EACH DAY, they take a lot longer to make than a couple pieces of toast! A lot of other breakfast foods that I make from scratch- granola, muffins, egg bake--are made in a big batch and some is frozen for later. Why not batch my smoothies?? How did I not think of this before! Now on Saturday or Sunday I take out everything I use for a variety of smoothies, and five mason jars, then get to work assembling. When I'm finished I've spent 15 minutes and have smoothies for the week lined up in the fridge. Ready and waiting. This has made having a healthy smoothie much faster, and mornings a little easier. Less clean up, just grab a jar, blend and go! Most people develop their own favorite base and change out fruit and protein choices (nut butters, protein powder, yogurt, flax, chia seed, spirulina) to mix things up. The recipes below make one large smoothie that will hold you til lunch, or a smaller smoothie for mom and two littles as part of a healthy breakfast. Another upside to using a jar is if you don't finish your smoothie, throw a lid on it and stick it back in the fridge. Often I'll have half for breakfast, feel full, and drink the rest for a mid-morning snack. 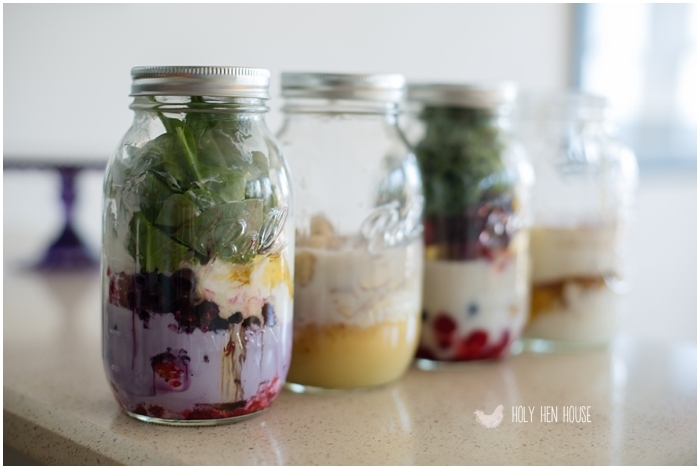 If your smoothie separate a little as it sits, just give the jar a shake when you take it out. PB & Banana Smoothie --my hubby loves this one, probably because it tastes like a shake. Kitchen Sink Non-Dairy Smoothie --leftover grapes? half a lemon? handful of cilantro? Throw it in. You've come to the right place. Click here to print off the smoothie recipes! Note: Some people shy away from smoothies because of the cost of fruit, particularly berries. In my house we try to buy organic produce when possible, but I always look for family size bags of frozen berries and stock up during in-season sales. I'm still working on 3 sheet trays worth of frozen blueberries from last summer! That said, organic, berry-heavy smoothies are about $2.30 each. Apple Cinnamon and PB & Banana recipes run $1.40. If you purchase conventional (non-organic) milk, yogurt, PB and produce, your smoothies will be anywhere from 30%-40% less. If this seems steep, consider the nutritional benefits and if not every day, think about incorporating a smoothie into your morning a couple times a week.